On vacation from college at St. John’s University in New York, Marcos Holguin had two days of double wahoo fishing with our Tailhunter Las Arenas fleet. 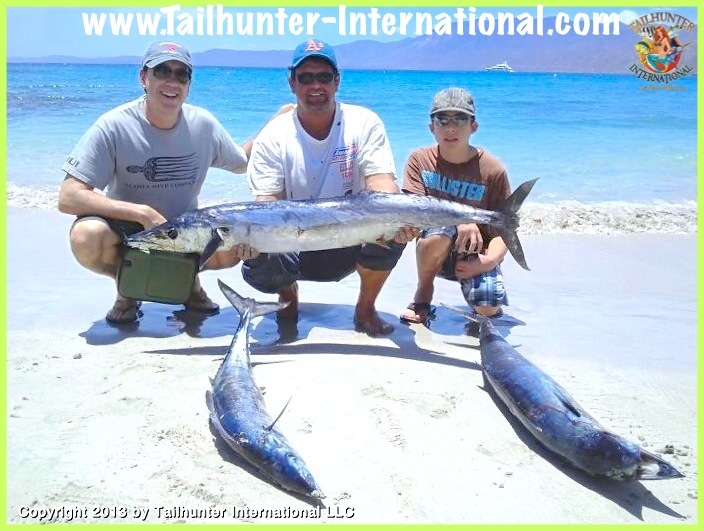 Mike Figley spent the week with us fishing 4 days with our Tailhunter La Paz fleet. This was his 2nd trip with us and I had just been telling him how strong tuna can be. He goes out the next day and tangles with this nice yellowfin that kept him bent for almost 90 minutes! He’s a believer now. He also got some great dorado fishing in! Mike’s from Arizona. 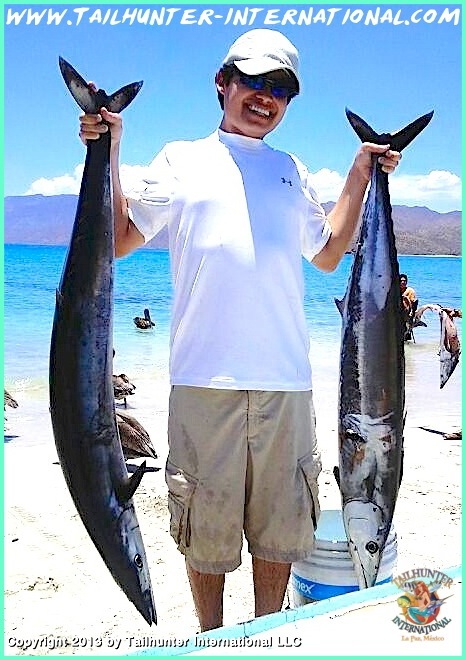 Jorge Romero, our La Paz amigo, only had 2 hours to get in some fishing so he jumped on one of our pangas and between 9 and 11 a.m. he put 3 nice bull dorado in the box fishing north of La Paz. He was trolling some small hoochies behind the boat because he left so late there was no more live bait left. This trio had some fun! 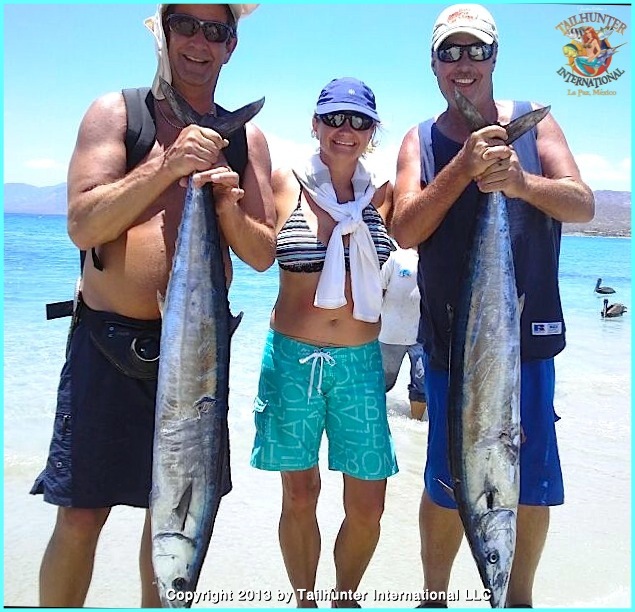 Tom Heaslet from Oregon along with Kathy and Darryl Pietak from the San Francisco Bay area, got 2 nice wahoo off Cerralvo Island. 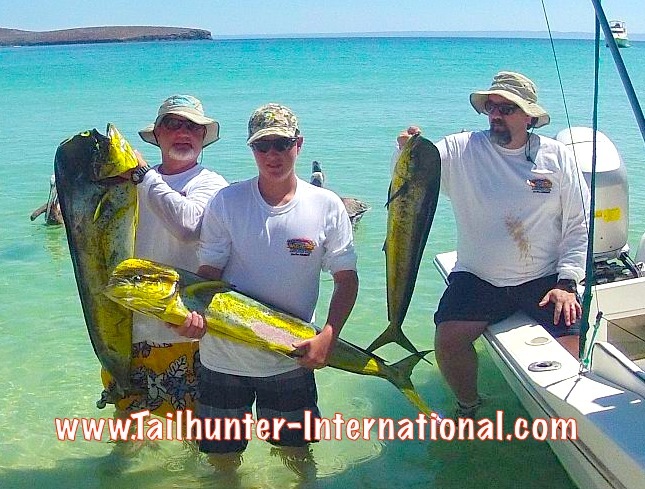 They also fished 2 days with our Tailhunter La Paz fleet and plugged the panga with dorado each day. 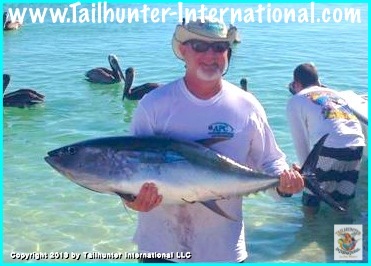 Dan Fuller from Childress, Texas, had a great week with us for his first visit with Tailhunters. He got his first dorado. He got his biggest dorado. He got his first billfish! 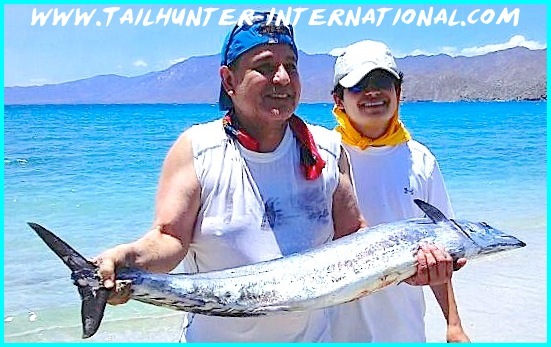 He’s here with big smiles…a big bull dorado…and Captain Rogelio from our Tailhunter La Paz fleet. This might be my favorite photo of the week. Big smiles from Bob and his son Bo Heinke from the Los Angeles area showing off big bull dorado on the beach at Bahia de Los Muertos. Steve Holguin visits us each year but missed last year. He made up for it with two days of nice wahoo like this one from his first day fishing with our Tailhunter Las Arenas fleet. 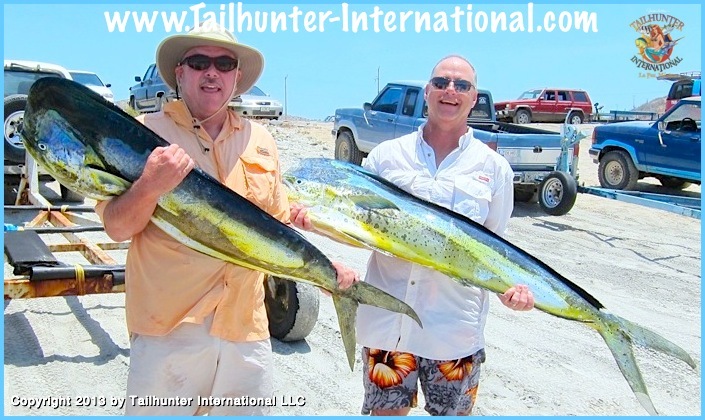 These two amigos had 4 of the best days fishing…they got dorado, sailfish, marlin and several other species. 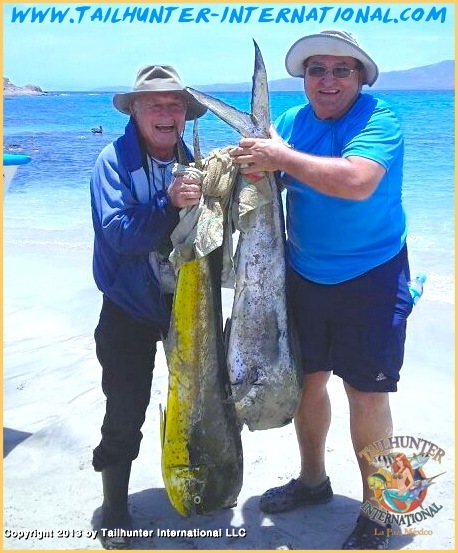 Rex Smith from Arizona and Mike Sontag from N. Carolina had not shortage of big bull dorado like these two on the beach at Bahia de los Muertos. Group shot! Mike Figley, Bo Cullwell and Dane Fuller fished four days and on their fourth day had one of those wild banner dorado days that was a complete frenzy and will make for good story-telling filling 3 pangas with limits in short order and multiple hook-ups. They’re starting to unload one of the pangas here on the beach at Balandra Bay. The week started slow…picked up some steam…then sort of evened out as the week went on. It took us a bit to recover from last week’s full moon with sporadic fishing, but some good catches of billfish for both our Tailhunter La Paz and Tailhunter Las Arenas fleets as well as some big dorado and even a few nice spots of 20-50 pound tuna that showed up north of La Paz. As with previous weeks, although there might not have been a lot of fish, the quality of the fish gave many of our anglers personal bests in terms of their biggest fish ever caught or, for many, their first billfish caught and released. It still wasn’t spectacular good fishing. Then, the week suddenly turned on a switch and boom! We had dorado going nuts for our La Paz boats where it was virtually one-stop shopping once the spots were located and dorado came crashing to the pangas with multiple hook-ups and our captains plugging the pangas within an hour of frenzied fishing and tired anglers coming back with frayed lines and big smiles plus ice chests full of fillets! As well, we had a big-time flurry of wahoo and billfish late in the week for our Las Arenas fleets as well with some of our pangas getting 1-3 wahoo hookups per day and just as many sailfish or marlin. Overall, the fishing for our La Paz fleet was better for sheer numbers while our Las Arenas fleet produced the trophy fish. The Mexican government at CONAPESCA keeps telling us, “maybe in a few weeks” they will have printed fishing licenses again. I guess that will happen when it happens. However, for the foreseeable few weeks, the only way to get your fishing licenses to fish down here is to purchase them online before you come down. The government did not print enough licenses for the year for the whole of Mexico so until the situation is remedied, you must purchase fishing licenses online. Do not be alarmed at the price…it’s in pesos!!! So just divide by 11 or 12 and that’s the rate in dollars and it will show up on your credit card statement in dollars. If it’s slow or doesn’t work at first, try again later. With this announcement, everyone in the whole of Mexico has to purchase their licenses online.